Who needs El Capitan? 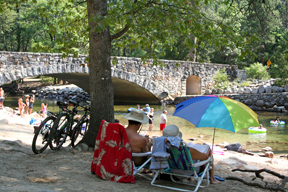 Visitors to Yosemite Valley don't have to stray far if they're looking for a good time. 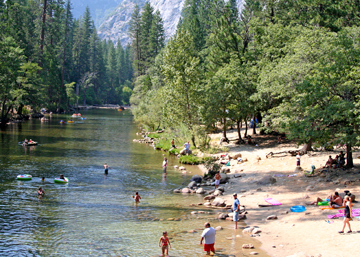 The beach here along the Merced is adjacent to all three of the big campgrounds and about a ten-minute walk from Curry Village. There's nothing like kicking back and doing absolutely nothing inside the most famous national park in the world. 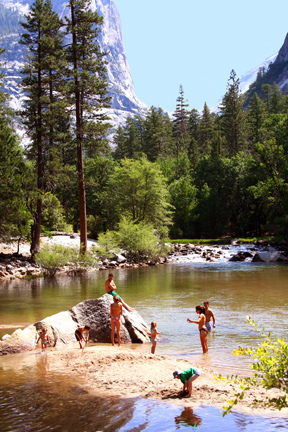 While more restless and ambitious tourists saunter off at daybreak to hike up the side of Half Dome and other sheer cliff faces, you'll find here me in my Speedo by around 10 a.m. -- baking in the sun, cooling off in the water, listening to music (i.e. other people's radios), watching dogs and kids play, and wishing I never had to return to civilization. There are the little drawbacks, of course. For one thing, the water is so cold, when you step out of it, you look like a grape popsicle. After all, this river was snow on a mountain side only a few hours earlier. 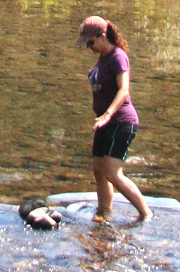 On the other hand, submerging yourself in the deep is an invigorating experience on any given scorching afternoon. If you're one of those brooding sorts of people who can never stop your internal dialog, trust me, this will do the trick. 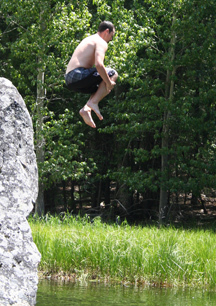 To be honest, relatively few people actually go in above their knees. As for me, I was doing the backstroke back and forth while the more common-sense minded crowd onshore seemed to be watching in amazement. No doubt they were wondering when they would have to pull me out and start CPR. Really, you don't want to push it. The cold water has a way of quenching the fire in your kidneys, and if you don't have the constitution of an Alaskan sled dog, it can take days to recover from the experience. Better to just dive in and out a couple times between long stretches of lying on your beach towel. Too much sun isn't healthy, either, but here there are plenty of pine trees just a stone's throw from the water's edge. Not far from this location is another one of my favorite hangouts - Mirror Lake. 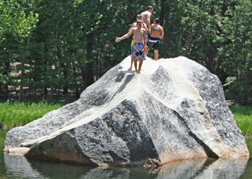 (I've already elucidated at length in a previous post on this place, which I believe to be the original Garden of Eden but have since taken more photos...) The kids really love climbing onto that big geometric rock parked in the Merced River, as you see in the upper shots. My time spent coaxing them to jump into the icy bucket below could probably have been better spent, but eventually the patience pays off and we photographers on shore finally get our pics. It's all very exciting, considering these divers land in about three feet of water, just barely enough to absorb the impact of their young frames. Hence, the tucked-knees position you see on the right. And just so you know, beginning in July, the water level drops to the point where diving becomes a suicide mission. 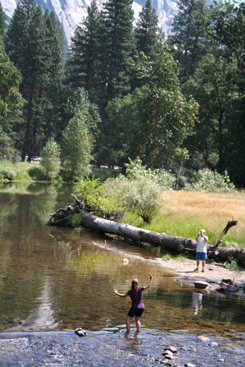 Less mystical but a shorter trek is a stretch of the Merced River that runs between Yosemite Lodge, off Northside Drive, and the chapel on Southside Drive. This area doesn't get as much attention as the two other spots I described, mostly because the water's not very deep and there's less shade. However, you see a lot of deer around here stopping for a drink. Even the occasional black bear foraging for berries is pretty commonplace. Besides that, you get to watch the rafters drift down the river near Southside Drive. Quite of few of them drop anchor along that shore to commence a drunken soirée. That can be fun to watch, too. Because of its central location in the valley, you can also see numerous landmarks from this mostly grassy area. 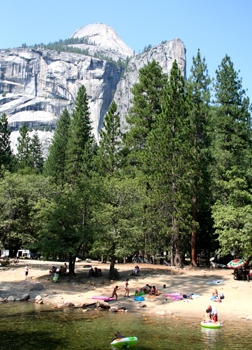 The vistas include Yosemite Falls, El Capitan, Cathedral Rocks, Glacier Point, Half Dome, North Dome etc. etc. And there's the adjacent meadow to the river with all the wildflowers in bloom through most of the summer. After eating breakfast or lunch at the food court by the lodge, this can be a nice diversion in an otherwise hectic tour ittinerary. 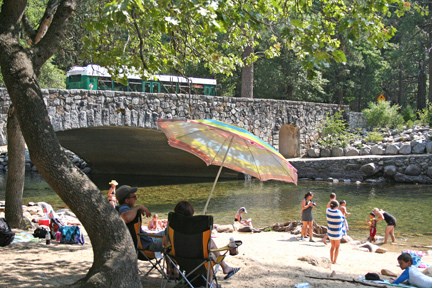 But of all the beachfront properties in Yosemite Valley, I prefer the campground beach near Curry Village, which was first on my rundown. Here, the convergenge of humanity celebrating a sunny day in unison is an event surely blessed by the gods, and how can you beat that? 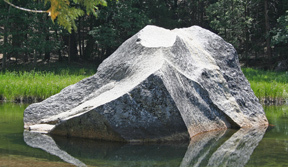 As for that rock at Mirror Lake, I wonder hot it got there? Riding a glacier? Rolling down the side of Hal Dome? Even now, I think about it, but I didn't at the time I was there. Don't think I had any questions about anything at all. Yosemite is not a place where you need to solve any riddles. All the answers come to you without having to think. 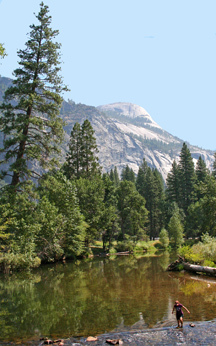 Return to Yosemite Trekker main menu.